There have been two professional football clubs in Ansan City. The first being part of the 'Imannuel' or 'Hallejujah' franchise and the second being the National Police. The Hallejujah team played in Ansan from 2007-2012 before moving on to Goyang. 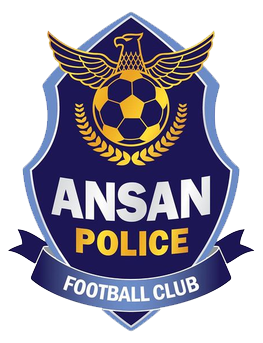 The Police team has played in Ansan since 2014. 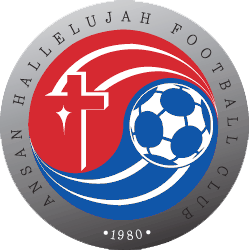 The Hallelujah franchise was founded in 1980, and managed to win the inaugural K League title in 1983. They combined with Imannuel FC in 1985 but changed their staus formm proffesional to amateur. The team became semi-proffesional again when taken over by retail conglomerate E-Land and renaming themselves the Pumas, but returned to amateur status after the 1998 Asian Financial Crisis. In 2003 the team was playing in Iksan, before being forced out by local Buddhsit protests, before moving to Gimpo City. 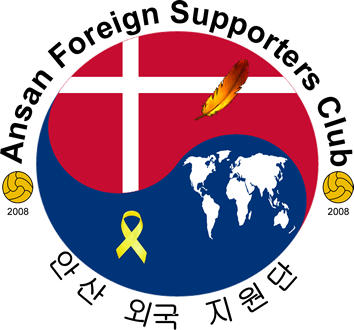 For the 2007 season the team moved to Ansan, adpoting the mantel: ‘Ansan Hallelujah FC’, basing themselves at the 36,000 capacity Ansan Wa Stadium, and comepted as a proffesional club in the National League, the second tier of Korean football. They maintained E-Land as their sponsor throughout their five seasons, and New Balance were responsible for designing their kits, with the home kit being typically white with a red cross, and the away being yellow with alternating blue and black crosses depending on the season. The team spent six full seasons in Ansan competing in the second tier, their highest position being seventh in 2008 just missing out on the league play-offs. For the first four seasons the team played in the Wa Stadium, but could only attract crowds of a few hundred. The biggest crowd came in the summer of 2010 when Ansan played against the national team, with then Manchester United midfielder Jisung Park acting as manager. The game attracted a record attendance for an Ansan game and was staged to earn money for charity. From mid-way through the 2011 season the team began playing games on the stadium’s side-pitch which had a small temporary stand. From the beginning of the 2012 season, the team played just a single match inside the main stadium. Towards the end of the 2011 season, the team was rumoured to be moving to another city, with Jamsil, an affluent area in Seoul, rumoured to be the destination. The reason cited for the move was a lack of crowd sizes, admittedly poor from a city of 700,000 people, but as argued earlier, more a reflection of a lack of city backing, and poor form. Team officials pointed to a conflict between Ansan City Hall and the teams religious affiliation. The team began the 2012 season with a new emblem and name. 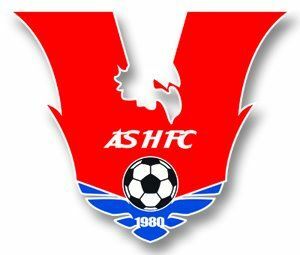 The ‘Hallelujah’ name had been, being replaced by a simple ‘H’, thereby giving the team the full name of ‘Ansan H Football Club’. The team kit was also redesigned, making the familiar red cross much less explicit. The rumours of a city move dogged the fans throughout the 2012 season, and this was eventually confirmed in September, with half a dozen games still to go. The team would be moving to Goyang City, again changing their name and logo, becoming ‘Goyang Hi Football Club’ for the 2013 National League season. No provisions for a replacement team for the city were in place and Ansan became the latest casualty in Korean franchise football. In 2014 it was announced that Ansan City would host the National police franchise. The police team has competed in Korean football since 1961 and is comprised of players who are serving their (typically) two year military service. This would bring potentially bigger stars to the Wa Stadium, altough many players are typically serving their service toward the end of the compulsary age (28-30). Players can also opt to play for the military team, presently playing in Sangju. Unlike the Hallelujah team, the police team played all of their 2014 home games in the Wa Stadium itself, and have a more robust ticketing system, including a season ticket option for the first time. The club also offers shirts, scarves and other merchandise for sale, another first for an Ansan team. Question marks still hang over the future of an Ansan team however, with the Police franchise likely to move to another city, and persistent rumours that the city will finally back a professional team.